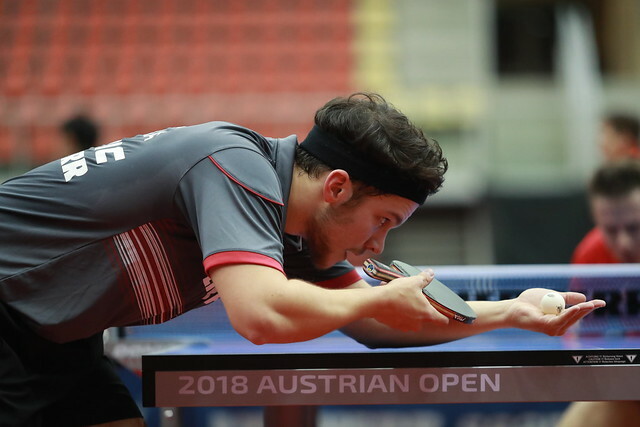 Semi-finalist three days earlier on home soil in Sweden, Mattias Falck emerged the major casualty as play commenced in the second preliminary round of the Men’s Singles event at the Seamaster 2018 ITTF World Tour Platinum Liebherr Austrian Open in Linz on Tuesday 6th November. The 27 year old, despite a spirited recovery, was beaten in seven games by Slovenia’s Deni Kozul (11-8, 11-8, 11-8, 4-11, 6-11, 9-11, 11-5). Defeat for Mattias Falck, as the top half of the draw progressed, there were defeats for further notable names. Nigeria’s Quadri Aruna lost to China’s Yu Ziyang (11-6, 11-9, 10-12 11-5, 12-10), Portugal’s Tiago Apolonia suffered the same fate as the previous week in Stockholm; on that occasion he had led Frenchman Enzo Angles by three games to nil a lost, in Linz he did the same when facing Germany’s Qiu Dang (6-11, 6-11, 6-11, 11-1, 11-6, 11-9, 11-9). Impressive from Qiu Dang, it was the same from Hungary’s Adam Szudi in opposition to Iran’s Noshad Alamiyan (11-7, 8-11, 6-11, 12-10, 14-12, 11-6), as it was from China’s Zhou Qihao and Liang Jingkun. Zhou Qihao beat Mihai Bobocica (7-11, 11-8, 11-8, 11-3, 12-10), somewhat more significantly Liang Jingkun accounted for Laurens Tromer of the Netherlands (11-13, 11-1, 11-6, 11-6, 11-1). Liang Jingkun has now qualified for the US$ 1,000,000 Seamaster 2018 ITTF World Tour Grand Finals. Otherwise, for the leading names in the top half the second preliminary round Men’s Singles draw, it was success. Germany’s Patrick Franziska beat DPR Korea’s Ham Yu Song (11-9, 11-9, 11-4, 11-9); Denmark’s Jonathan Groth overcame Poland’s Marek Badowski (12-10, 6-11, 11-9, 11-6, 11-6). Meanwhile, there was also success for the Japanese trio comprising Maharu Yoshimura, Yuya Oshima and Kenta Matsudaira in the second preliminary round of the Men’s Singles event. Maharu Yoshimura beat Thailand’s Supanut Wisuthmaythangkoon (11-8, 11-6, 11-8, 9-11, 6-11, 11-7), Yuya Oshima overcame England’s Andrew Baggaley in a seven games encounter (11-4, 4-11, 11-8, 9-11, 6-11, 11-5, 11-7). Similarly, in a hard fought contest, Kenta Matsudaira ended the hopes of China’s Zhou Kai (13-11, 11-9, 8-11, 11-8, 11-8). Success for prominent names and there was success for arguably the most prominent of all on qualification tournament duty; Vladimir Samsonov of Belarus beat Germany’s Kilian Ort (2-11, 4-11, 13-11, 11-6, 11-9, 15-13). “In the first two sets I had big problems receiving his service; he was able to create big pressure. I think the first sets had gone in less than five minutes; then I fought back and could luckily take set three, being three-nil down would have been probably too much to come back. The Level of qualification rounds is so high; it’s like playing a main-event.” Vladimir Samsonov.